If you’re thinking of selling your property either now or in the future, ultimately one of the main goals will be for you to achieve more money for it on this sale than when you paid for it. To work your way up the property ladder, it’s worth knowing which areas of home improvement can bring the biggest returns, and even if you plan on staying in your current home for the time being, it’s important to know which improvements can add value to help you understand which projects are economically viable. In today’s buying market, double glazing is a must-have on any property. If you have old single glazed windows or even aging double glazing, investing in new double glazed, more energy efficient windows will not only be attractive to a prospective buyer, but also add value to the whole property too. The fact that new double glazed windows will also help save money in the long term for whoever is living in the property, through their effectiveness at keeping the warm in and cold out, will also be an attractive option to any home buyer. They say the kitchen is the heart of the home, so ensuring your kitchen is looking its very best will do wonders. An attractive, clean and hygienic kitchen will be a big draw for those viewing your property, and whether you opt for a brand new design or simply replace a few cupboard doors and the worktops, you’ll be adding value with every improvement you make. 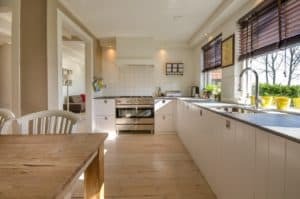 Before you fully replace a kitchen, why not consider the size and shape of it, and whether it could be improved further by making some structural changes that make better use of the space or even increase its size? Space, and particularly bedroom space, is what many buyers will be looking for, and getting the bedroom space right is a great way to add value. By considering a loft conversion, you could benefit from being able to sell your home with an extra bedroom and maybe en-suite bathroom too, which will undoubtedly bump up the price. There will be an investment required on your part for the work to be completed, but the end results will not only add aesthetic appeal and additional space whilst you’re still living in the home, but then further value when a surveyor pays you a visit to identify how much to put your property on the market for. It’s very easy to think just about the structure and interior of your home when looking at ways to add value, however it’s important not to neglect your outside space too. In order to be attractive to potential buyers you must do the basics, so ensure any grass is cut, the garden is tidy and attractive, and all fences are in place and where they should be! Once you’ve achieved this though, you can then start to consider changes that will add value. Privacy in a garden space is key, so creating a feeling of seclusion through fences, hedges and trees can help you add value. You can then explore structural additions that not only look great, but will also catch the eye of a buyer, and the valuer too! Have a look at decking or patio areas as well as summer houses, sheds and pergolas to make your outside space look a million dollars. Following on from working on your outside space, the addition of a conservatory can be the perfect link between outside and in. 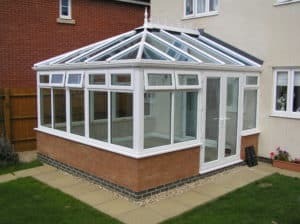 As well as adding some much desired extra living space downstairs, a conservatory provides the perfect opening to your garden, and will be particularly effective when the sun starts to shine during the summer months. A conservatory has numerous uses, from acting as a playroom for the kids to run wild in, and have all of their toys stored in, to an adult’s escape perfect for reading the paper on a Sunday morning or a good book away from the hustle and bustle of the rest of the house. There are many changes that you can make to your home to add value when you are looking to sell, some of which will require time and money invested, whilst others can be smaller yet achieve equally effective results. If you’re looking to sell now or in the future, why not consider exploring one or two of the options we’ve identified above to add some more value when your property hits the market? Take advantage of our £495 sales fee, available for a limited period. Please ask for details.